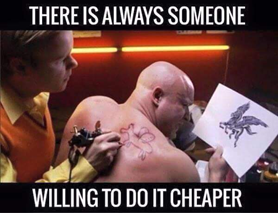 Anyone who knows me knows my on-going railing against lowest-priced providers in SatCom space and the farce that they are doing their customers any kind of service. I’ve heard story after story about the complete lack of support that a lowest-priced provider offers, including a disaster-response agency whose lowest priced provider’s ‘support’ is a web page; fill out a form and never get a response. Perfect: Mission-critical responders who can’t get help. Everybody is selling the exact same phone, the same data terminal, the same service plans. How much they know about what they are selling you? What are they selling you – The right solution, the solution du jour, their overstock? Will they take care you after the sale? How do you know? So you buy a satellite phone at the lowest possible price from a cheap-o provider. Great, you saved a few bucks! Here’s the question: Is the amount you saved worth the risk you’re taking? I once posed this question to the purchasing agent who was negotiating a state contract. His response was shocking and revealing. “I don’t care, it won’t impact me.” I agreed with him, affirming that when there was an emergency and his state employees couldn’t get help at 2:00 on a Sunday, it would indeed have no impact on HIS life – he’d be comfortably asleep in bed. But his short-sighted decision would then be jeopardizing everyone who was using that SatCom service. He awarded the contract to the lower bidder. We once responded to a bid where the user specified the make and model of the phone. The buyer (not the user) then added the dreaded, “Lower Cost Technically Acceptable Substitute” meaning she would entertain different solutions if the seller could convince her that it would work just as well. Keep in mind the buyer has no knowledge of satellite phones; it’s ‘just another commodity’ to her. Sat phones, today pencils tomorrow, trashcans on Monday. The award went to a provider that proposed a lower-priced solution that didn’t meet the user’s specs so he had to spend 150% of the cost of the phone to ‘fix’ the buyer’s mistake. They paid the lowest price. Then they paid the highest price. We all know that spending less money on something means we will get something less. It is an irrefutable law of business, economics, and life. So why do continue to pretend that buying at the lowest price doesn’t have a hidden price all its own? It’s an incredibly expensive way to think.